Brooke Wiseman Murphy, 17, was last seen in the area of Battlefield Green subdivision, located in Hanover County. 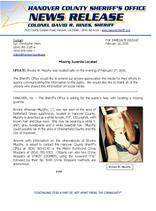 Murphy is described as a white female, 5’4”, 132 pounds, with brown hair and blue eyes. She may be wearing a white t-shirt, gray sweatpants and a white baseball hat. Murphy could possibly be in the area of Chesterfield County and the City of Hopewell. Anyone with information on the whereabouts of Brook Murphy, is asked to contact the Hanover County Sheriff’s Office at (804) 365-6140 or the Metro Richmond Crime Stoppers at (804) 780-1000. Citizens can also text Crime Stoppers at 274637 (CRIMES), using the keyword “iTip” followed by their tip. Both Crime Stoppers methods are anonymous.